Crate Amplifiers started as a flash of inspiration by Gene Kornblum, who was the leader of St. Louis Music, Inc. at the time. St. Louis Music started business in 1922 by Gene's dad, Bernard, focusing on importing and distributing violins and violas. In the late 1970's, Gene happened to be in a Crate & Barrel store and saw how the products were displayed in wooden crates. He thought the wooden case could be beefed up to hold a guitar amp. Turns out he was right. In 1978 the Crate CR1 was introduced. It was a 10 Watt practice amp - the first guitar amplifier built by St. Louis Music. By the early 80's, they were selling enough Crate amplifiers to outgrow the existing manufacturing capabilities. Because amplifier sales were going so well, the company expanded the Crate line to include a full range of solid-state guitar amplifiers. St. Louis Music didn't keep the wooden crate look for too long, moving to the traditional Tolex covering after a few years. That was pobably a good move from an aesthetic standpoint, however it was a unique design and that probably helped sales quite a bit. I do remember walking into a music store in 1987 and seeing a Crate amplifier sitting on the sales floor. It was the wooden shipping crate style, and I remember thinking that was a pretty cool case. While I'm a tube snob now, I've had a few solid-state amplifiers in my day, and the distortion you can produce is pretty tight. The Crate amps I've heard have had good tone. Crate eventually jumped on the tube bandwagon and began producing a line of tube amplifiers. Taking a queue from British amp manufacturers, the all-tube amplifiers typically use EL-34 or EL-84 tubes. You can expect tones similar to what you'd get from a Marshall or Vox. In 2005, the Kornblums sold St. Louis Music to Loud Technologies, transferring Crate to the new owners. Loud acquired St. Louis Music's other brands as well - Ampeg, Blackheart and Alvarez. There's a very interesting write-up about the company history on a business investment website. Included in this write-up is the story of how Crate amplifiers came into existence. This profile was written before the St. Louis Music was sold to Loud Technologies. 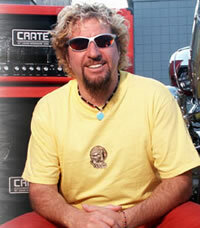 Crate amplifiers are endorsed by musicians playing all forms of rock music. There are a number that made their name in the 80's that have continued to work with Crate amplifiers. What's interesting is that these artists are unpaid endorsees. Some of the artists endorsing Crate amps are Gene Simmons (KISS), Sting (The Police and solo), and Sammy Hagar (solo, Van Halen and Chickenfoot). Billy Gibbons of ZZ Top is an endorser of Crate, as well as Joe Walsh (solo, James Gang and The Eagles), C.C. Deville from Poison. Even Bo Diddley enjoyed the tones he got from his Crate amplifiers. Crate has come a long way since the wooden shipping crate days. Those early solid-state amplifiers have made room for a line of tube-driven amplifiers. In an effort to capitalize on the boutique market, Crate also introduced the Blackheart line of all-tube amplifiers. Crate offers three distinct lines of amps. On the solid-state front, the Flexwave Series offer up three wattage choices and both combo and head/cabinet setups. For a practice amp, there's the 15 Watt FW15. To handle small venues, there's a 65 (FW65) and 120 Watt combo (FW120). You can also get the FW120 as a head, matching it up with a Crate 4x12 cabinet. The V-Series guitar amplifiers are all tube models, ranging from 5 watts up to 100 watts. The lower wattage models come with EL84 tubes, while the V50 comes with 6L6s and the V100 sports EL34 power tubes. 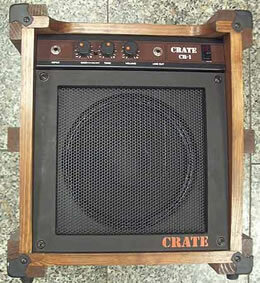 Crate also manufactures a line of acoustic amplifiers, offering some nice features for amplifying acoustic guitars. From the low end, there's a 10 watt model (CA10) that's pretty bare-bones functional. The CA15 adds spring reverb (always nice on clean tone). Once you get to the 30 watt model (CA30DG), Crate has added digital effects to the mix. You can get up to a 120 watt acoustic amplifier (CA120DG).